A few blocks from the parade of starchitect supertalls going up along 57th Street in Midtown, an experiment in typology is under construction. This will be the first New York project from the Bjarke Ingels Group (BIG), a firm started in Copenhagen that has built many critically acclaimed projects worldwide with the firm's emphasis on addressing site and program with innovative solutions through form. While other projects nearby are locked in an arms race of height and flashy facades, W57 seeks a revolution in typology that has a significant impact on the inhabitants of the building and challenges the catalog of types typical to Manhattan. BIG was approached by the Durst Organization, a firm known for its innovative and sustainable portfolio of projects, to propose a design for a mid rise building on the Far West Side of Manhattan. Inspired by the classic Copenhagen courtyard block typology at the architectural scale and its urban scaled counterpart, the iconic Central Park at the heart of the city, the firm proposed a mash up of a New York skyscraper with a courtyard, which they have called a "courtscraper." Southeast corner of W57 (left) and the Helena (right) from West 57th Street. The rectangular site occupies about three quarters of a block fronting the West Side Highway and the Hudson River and is adjacent to another Durst tower, the Helena. BIG started with a rectangular block with a centrally located courtyard that is exactly the same proportions as its inspiration, Central Park. The northeast corner of the block is then pulled upwards to an elevation of 470 feet to transform the low rise block into a tapering pyramid-like tower. Not only does this allow for spectacular views of the waterfront and the courtyard green space for its inhabitants, the sloped form also preserves waterfront views for the Helena which is situated south of the building's peak. Secondarily, the building's unconventional form also allows for a multitude of readings depending on your location. 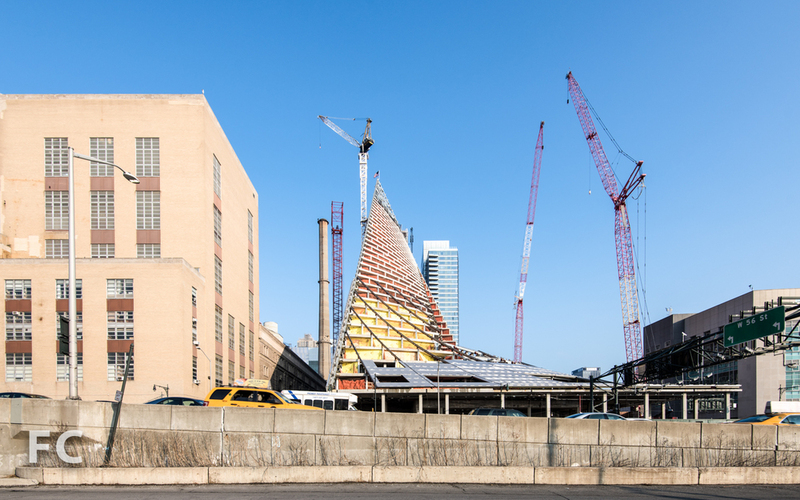 From West 58th street, the northeast corner reads like a slender tower, while views from the waterfront and West 57th Street reveal a broad pyramid form. Southwest corner from West 57th Street. The exterior envelope of the building employs two main strategies: a sloped wall on the south and west street front, and a herringbone pattern of bay windows along the north and east facades. With the sloped southwest wall, BIG seeks to merge the ideas of wall and roof, while adding slots for outdoor terraces adjacent to individual units. At the peak of the tower, mechanical elements are housed and concealed by an extension of the sloped facade that incorporates the terrace slots as vents for machinery. The herringbone strategy at the north allows for each unit to have a view to the waterfront which would not be possible with a conventional flush curtain wall. This strategy is also employed on the courtyard face to direct views southward along the waterfront. Southeast corner from West 57th Street. Lobby entry along the east facade. Inside, the building will house 709 rental units and 45,000 square feet of commercial retail space. Entry to the lobby is off of the east, in an open space between the building and the Helena. A grand stair is centrally located in the lobby and brings residents up to the courtyard space, while sheltering the mail room tucked underneath. The courtyard's landscape design will employ a gradient of plantings to evoke a range of spaces, from a meadow to a shaded forest. In addition to the large central courtyard, amenities for the residents include a basketball court, pool, gym, cinema room and golf simulator. The grand stair in the lobby, leading to the central courtyard. Looking west from the eastern edge of the courtyard. The courtyard's north exterior wall in progress. Residential corridor wall covering detail. View from a corner window along the north facade. Looking west from an outdoor terrace. Looking south from an outdoor terrace on the second floor. View of the sloped facade's structure. Looking south from an outdoor terrace. View of the sloped facade's structure and window wall under construction. Window wall installation on the south facade. South facade in the morning sun. South facade in the afternoon sun. The mechanical enclosure structure that forms the peak. Looking south from the peak structure. Looking north from the peak structure. Looking north from Riverside Park. West facade from Hudson River Greenway. Northwest corner from Hudson River Greenway. Northeast corner from West 58th Street.. While elsewhere in the city architecture will continue to vie for the claims to being the tallest, BIG has proven with this project that size is not the only measure of architectural impact. Long after we forget which tower won the height race in a given year or sold its penthouse for the most money, BIG's courtscraper will resonate in the history of New York architecture and its innovative strategies will impact future projects around the city. North facade from West 62nd Street. Architects: BIG (Design Architects), SLCE Architects (Architects of Record); Developer: The Durst Organization; Program: Residential, Retail; Location: Midtown West, New York, NY; Completion: 2016.